The son of a German clockmaker Magnus Volk was born at 35 (now 40) Western Road, Brighton on 19th October 1851. 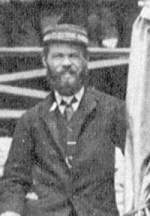 Educated in the town he was eventually apprenticed to a scientific instrument maker but on the death of his father in 1869 he returned home to assist his mother run the family business. Scientific and engineering events in the wider world were of great interest to Magnus and he was forever experimenting with electricity, telegraphy and telephony. His growing prowess as an inventor and engineer and the fact that he was the first person in Brighton to equip his house with electric light, led to him being awarded the contract for providing the famous Royal Pavilion with electric incandescent lighting. Contacts made during this period were to prove very important with Magnus’s next and most long-lasting project. 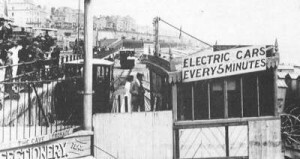 At noon on August 4th, 1883 Magnus presented the people of Brighton with his latest creation – an electric railway operating over a quarter of a mile of 2ft gauge line extending from a site on the seashore opposite the Aquarium to the Chain Pier. Power was provided by a 2hp Otto gas engine driving a Siemans D5 50 volt DC generator. The small electric car was fitted with a 1½hp motor giving a top speed of about 6mph. The tinting of the original black and white photograph is our interpretation of the contemporary press description of the car. Magnus is standing on the left hand platform with the Mayor on the right. No sooner was the railway open than Magnus sought powers to extend it westwards along the beach to the town boundary. To his dismay the Council turned this proposition down so he reversed direction and succeeded in getting permission to extend eastwards from the Aquarium to the Banjo Groyne. He also secured the rental of the ‘Arch’ at Paston Place to provide workshop and power facilities. Following experience gained from the first line he also decided to widen the track gauge to 2’8½”, and he designed two more powerful and larger passenger cars. Although the line would run along the seashore it still required a lot of timber trestles to bridge gaps in the shingle, and severe gradients down and up to allow the cars to pass under the Chain Pier. 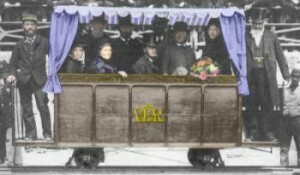 The picture to the left is from the cover of a book produced by Volk promoting his new railway. In the background can be seen the Chain Pier. The new line opened on April 4th 1884 using one car. The uprated power plant in the ‘Arch’ consisted of an Otto 12 hp gas engine powering a Siemens D2 dynamo at 160 rpm. This gave an output of 160 volts at 40 amps – more than sufficient to propel the two new cars along the 1,400 yard long line. 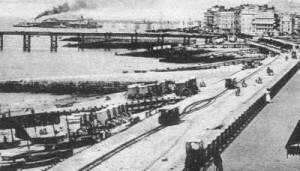 A station was provided adjacent to the Banjo Groyne, and a loop complete with halt was provided halfway along the track for cars to pass. With the arrival of the second car a 5 or 6 minute service was provided daily summer and winter (excepting Sundays until 1903) – weather and storm damage permitting. It says a lot for Magnus’s fortitude and engineering that this service operated right up until 1940 when the threat of invasion closed the railway for the duration. This picture shows the original Aquarium Station with two cars in view. The station now boasts two platform roads and somewhat reduced passenger facilities compared with the previous engraving! Current was fed to the motors on the cars by using one running rail as the live feed and the other for the return. One wheel of each axle on the cars was fitted with a wooden centre thus preventing a short circuit. 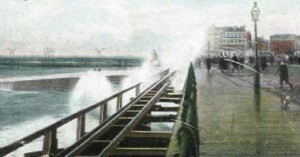 Unfortunately leakage to earth caused by the wet conditions – especially where the line dipped under the Chain Pier – caused enough problems for an insulated third rail to be fitted in 1886 offset from the sea-side running rail to provide the live feed with return now allowed through both running rails. At the same time the track was raised throughout its length by means of a wooden viaduct. As this picture shows the sea showed no respect to the raised line, even in mildly rough weather. In 1896, 10 years after raising the track, a storm of gigantic proportions swept away the old Chain Pier and almost financially ruined Volk who had temporarily forsaken his electric railway for a new venture. In 1890, frustrated at his inability to extend beyond the Banjo Groyne, Magnus progressed a grand scheme for an alternative railway which ran through the sea. Affectionately known as ‘the Daddy Long Legs’, this is described elsewhere on this site so for now we will concentrate on Magnus’s more orthodox electric railway. 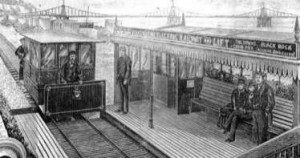 Although there seems to have been constant problems with the fishermen and cabbies who worked alongside the line, Volk’s Electric Railway proved very popular with the public and attracted many passengers. To cope with this increase in traffic two new cars (numbers 3 & 4) entered service in 1892, and a fifth car followed in 1897. Although both of these pictures below date from the early years of the 20th century they show the railway very much as it would have looked before the final phase of extension in 1901. In the left picture a steamer takes on passengers from the end of the West Pier while two cars on the electric railway have just negotiated the ‘eastern’ passing loop. The right hand picture shows the car sheds and station at Paston Place with the Banjo Groyne in the background.